Bag inflation system with actuated butterfly valve for maximum fill volume. 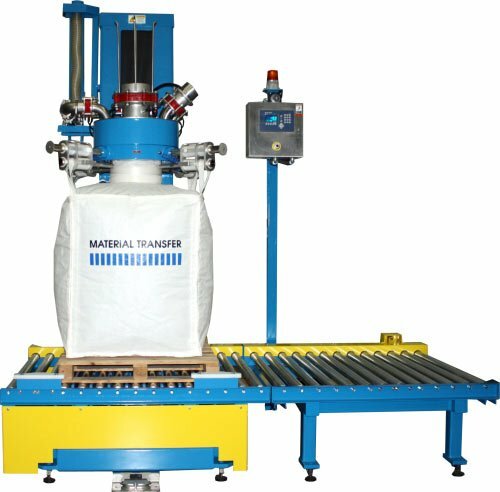 Hydraulic Power-Lift™ system automatically positions fill head for ergonomic bag connection of various size bulk bags. Power-Lift™ system can be programmed for automatic bag stretching, including full bag lift capability. Unit features a heavy-duty, high output, “pop up” densification system with variable frequency drive to settle material during and after fill cycle. Gain-in-weight scale system with NTEP approved load cells in filler base. System includes an integral check weigh station with integral powered roller conveyor.